Give the gift of prayer in times of joy and in times of suffering. Mass Cards can be a wonderful way to show your friendship to someone who is celebrating a birthday or anniversary, mourning a loss or any number of other life events. Each of our unique mass cards has been designed from an original photograph taken by one of our sisters, Belen Escauriaza. 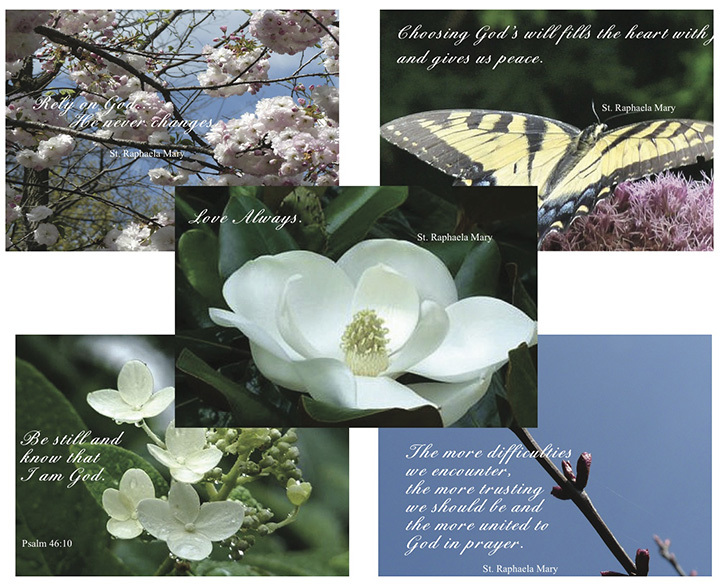 The cards feature beautiful representations of God’s handiwork, along with an inspirational quote from St. Raphaela Mary or a scripture reference. How do Mass Cards Work? When you order Mass Cards, you pay nothing. Mass Cards are free, so it costs you nothing to have a number on hand for various needs. When you use a mass card, you send a donation to the Handmaids, using the address included in the card. Then you’ll send the attractive card to your friend or relative, and they’ll know that an intention on their behalf will be included in a Novena of Masses and that a donation was made to the Handmaids of the Sacred Heart of Jesus.